Cottage cheese pancakes... kind of a funny concept, huh? 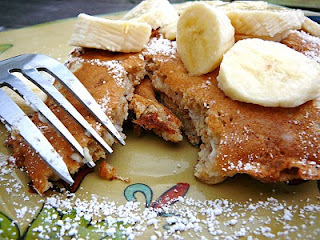 But, the cottage cheese makes a pancake, especially a wheat one, more light and fluffy. Once they are cooked, you really do not notice the cottage cheese. These flap jacks also have more protein than your regular pancake. Serve these topped with some homemade jam or berries (I only had bananas). In a large bowl, combine flour, baking soda, and sugar. In a separate bowl, combine egg whites, cottage cheese, milk, and oil. add flour mixture to egg mixture and whisk until blended. Spray skillet with cooking spray and heat over medium heat. Place 1/4 cup batter onto the skillet. Cook, flipping once, until golden brown on both sides and cooked through, ~5 minutes. Serve! Do you think that 1 cup old fashioned oats would work in place of the 1 cup whole wheat flour?